U.N. inspectors found Iraq's nuclear program in disarray and unlikely to be able to support an active effort to build weapons, the atomic agency chief said in a confidential report obtained Monday by The Associated Press. International Atomic Energy Agency chief Mohamed ElBaradei reiterated that his experts uncovered no signs of a nuclear weapons program before they withdrew from Iraq just before the war began in March. The United States and Britain invaded Iraq because they believed Saddam Hussein's regime was developing nuclear arms as well as chemical and biological weapons. No weapons of mass destruction have turned up in Iraq, nor has any solid new evidence for them turned up in Washington or London. Some may represent miscounts, they say, and some may stem from Iraqi underlings' efforts to satisfy the boss by exaggerating reports on arms output in the 1980s. "Under that sort of regime, you don't admit you got it wrong," said Ron G. Manley of Britain, a former chief U.N. adviser on chemical weapons. Chief U.N. inspector Hans Blix, as he left his post this summer, became more open in discussing discrepancies. After the mid-1990s, "hardly ever did (inspectors) find hidden weapons," Blix reminded one audience. "What they found was bad accounting." The discrepancies, disputed for years between U.N. inspectors and Iraqi officials, may be of more interest now that U.S. weapons hunters are failing to find Iraqi chemical or biological arms. Those weapons hunters, the Iraq Survey Group, say they still expect to find evidence of such programs. Their first interim report is expected in mid-September. Through spokesman Kenneth Gerhart, they declined to comment on the role of the U.N. discrepancies list in their current work. Defense Secretary Donald Rumsfeld said Monday he is not keeping track of the hunt for weapons of mass destruction in Iraq. Rumsfeld met in Baghdad on Saturday with David Kay, the former U.N. weapons inspector leading the American weapons hunt. Rumsfeld said the two discussed logistics, not Kay's findings. "I did not ask and did not hear" anything about weapons findings, Rumsfeld said. "I did not go into a half-hour meeting saying 'OK, lay out what you found.' I'm assuming he'd tell me if he'd gotten something." In his address to the nation Sunday night, President Bush mentioned weapons of mass destruction twice. "We acted in Iraq, where the former regime sponsored terror, possessed and used weapons of mass destruction, and for 12 years defied the clear demands of the United Nations Security Council," he said. Later, he said, "For the Middle East and the world, there will be no going back to the days of fear, when a brutal and aggressive tyrant possessed terrible weapons." ElBaradei told the Security Council just before the war that his inspectors had no conclusive evidence Iraq had resumed a nuclear weapons program. In the new report, he said his agency "observed a substantial degradation in facilities, financial resources and programs throughout Iraq that might support a nuclear infrastructure." "The former cadre of nuclear experts was being increasingly dispersed and many key figures were reaching retirement or had left the country," he said. 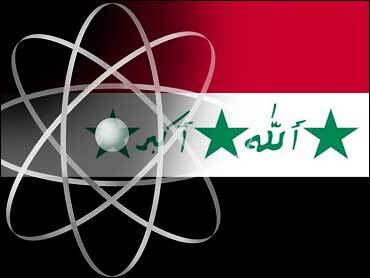 Iraq had denied it was trying to build atomic weaponry. It could have done more while IAEA inspectors were still in the country to clear up lingering doubts about its intentions, ElBaradei suggested in the confidential report. Earlier this year, U.N. teams were working with Baghdad to pin down some loose ends. The Iraqis had begun scientific soil sampling, for example, to try to confirm the amount of VX dumped long ago at a neutralization site, and had filed an initial report on March 17. Three days later, however, the U.S. invasion intervened. It was always a "fragile assumption" to expect Iraq to provide a highly detailed, fully consistent and well-documented account of all its weapons work, said U.S. defense analyst Carl Conetta. No military can do that, he wrote in a report recapping the Iraq inspections. A U.S. audit last year, for example, found the Pentagon had lost track of more than 1 million chemical-biological protective suits, said Conetta, of the Project on Defense Alternatives, a private think tank. In perhaps the most striking example, U.S. government auditors found in 1994 that almost three tons of plutonium, enough for hundreds of nuclear bombs, had "vanished" from U.S. stocks, because of discrepancies between "book inventory" and "physical inventory."